CONCEPT Professional Training, a global leader in online and live professional training in forensic mental health, announced today that it will be offering two Spring Training sessions focused on violence risk assessment training. Each program consists of both guided online training plus weekly professional consultation, beginning March 21st, 2016. 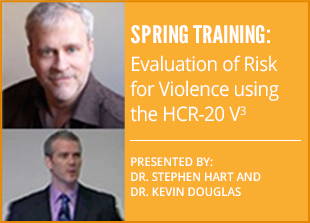 One of the main training programs offered is the Evaluation of Risk for Violence using the HCR-20-V3 Spring Training Session is presented by Dr. Kevin Douglas and Dr. Stephen Hart. This threat assessment training program focuses on the revised HCR-20 (now called HCR:V3) in the U.S. and describes why and how the HCR-20 was revised; how Version 3 differs from its predecessors; and initial research validation of Version 3. The trainee is taken through the foundation for structured professional judgment, how to rate the presence and relevance of each of the HCR-20 Version 3 items, how to formulate risk scenarios, how to consider case management issues for the evaluee, and how to conceptualize and provide summary judgments regarding the evaluee’s overall risk. Participants will also complete the HCR:V3 on a practice case. This session includes approximately 2 hours of online training plus one hour of small-group consultation to discuss cases, questions, and other clinical implementation issues; weekly. Participants will work independently, on their own time, each week on the training materials but will come together for 1 hour of small group consultation time with an instructor. This 10-week training program is primarily for criminal justice, mental health, and victim support professionals – those who work with (alleged) perpetrators and victims of violence. * Apply the HCR-20 Version 3 to actual case analysis. For more information on Evaluation of Risk for Violence using the HCR-20-V3, click here. For more information on all Spring Training sessions, visit the information page.